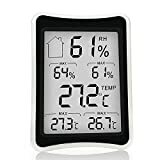 THERMO-HYGROMETER MONITOR – This Thermometer real-timely measure the temperature(Fahrenheit or Celsius) and humidity, and give out COMPORT, WET and DRY three environmental comfort levels according to the temperature and humidity conditions. VERY PRACTICAL – Monitor humidity and temperature in different rooms, such as home, living room, office, basement, attic, warehouse, greenhouse, and so on. It is important to have this Indoor Thermometer and Hygrometer Monitor. EASY OPERATION – Only two buttons on the back–CLEAR and ℃/℉(Switch between Fahrenheit and Celsius freely). You can also easily reset the MAX/MIN record by pressing the CLEAR button. VISUALIZED LARGE DISPLAY – The large LCD display shows all the information about thermometer( Fahrenheit or Celsius) and humidity, you will know clearly daily high and low temperature and humidity by the monitor. * Multiple Mounting Options — You could place it on your desk, or mount on the wall and find something to fix, like a nail, avoid to fall off. * Smart display with three specialty regulator levels so that you know if your home has low, comfortable or high humidity. * Measures current readings and compares to daily records so you know how to best prepare for the day. * Easy to clear settings, press the clear button to clear the record maximum and minimum humidity/temperature readings. ★Preventing the growth of mold, bacteria, viruses, fungi, mites, and other asthma-inducing agents in your home by Maintain your rooms an ideal humidity and temperature level. ★Remind your attention of health such as Skin, Cold, Tracheitis, Arthritis and Myocardial infarction. ★To ensure ideal indoor thermometer and humidity control in office, living room, greenhouse, warehouse.